In today's Sunday Telegraph, Jonathan Wynne-Jones had a scoop with the story of the memo drawn up by Foreign Office officials after a "brainstorming session." 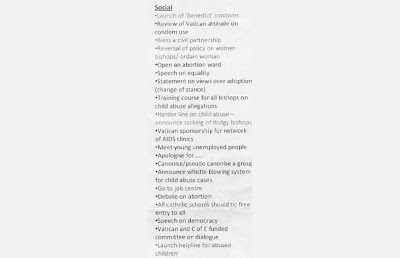 (See: Ministers apologise for insult to Pope) Above is the scan that he posted containing the most offensive part of the memo. 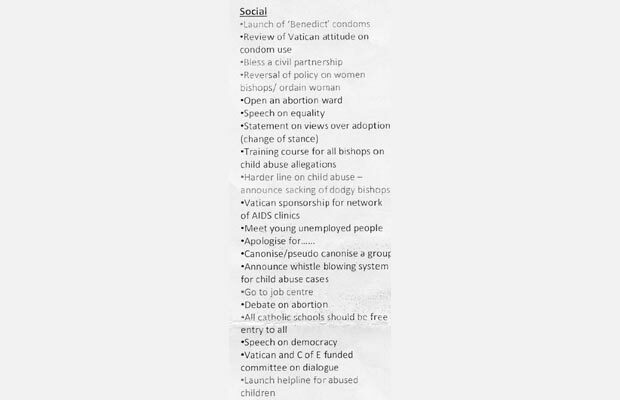 Damian Thompson has pointed out that for all the frantic apologising that has gone on today, the document reflects an attitude that is widespread in our politically correct government. The official concerned has been told that the memo was "a serious error of judgement". He has apparently "accepted this view". In the light of the obvious sincerity of this Damascene conversion, he has been "moved to other duties". Foreign Secretary David Milliband goes further to say that the failure of judgement was "colossal". Failure of judgement? In what precisely? To put forward those ideas in the first place, to put them down on a memo, to circulate the memo, or to allow it to leak to a journalist?